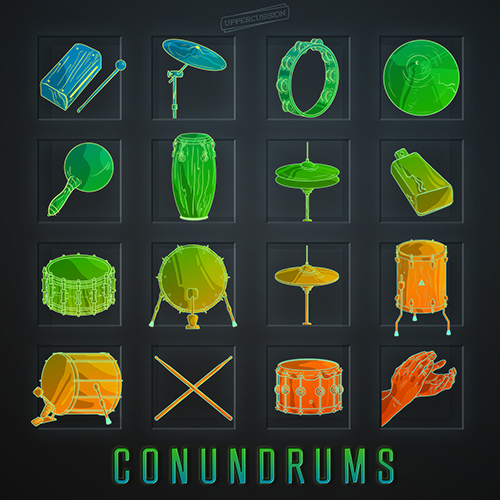 Conundrums is a collection of 50 solid drum kits designed to be a go-to library for all kinds of productions created with a 16-pad interface. The library includes processed sounds originating from studio sessions, field recordings, and both analog and digital sound synthesis. Conundrums will add pounding kicks, cutting snares and claps, hihats and cymbals, percussion, hits and more to your beat-creation arsenal. The sounds in each Conundrums kit have been tweaked and tuned to play in perfect harmony with one another, giving you the flexibility to create all kinds of combinations for beat making. All drum kits are similarly mapped for seamless switching among them, making it easy to use the same drum pattern with a wide variety of kits. 800 samples, 16 samples per kit. Formats include Maschine 1 & 2, Ableton Live Pack*, MPC, FL Studio, Geist, Battery 3 & 4, Kontakt, EXS24, Halion, NN-XT, and single WAV samples. Sample folders are easily accessible and sorted by sound type. Total size is 175 MB. 50 MIDI patterns (one in each Live Clip). 8 Macro assignments per kit. *The Ableton Live Pack of Conundrums is only available as a separate purchase through the Ableton website.